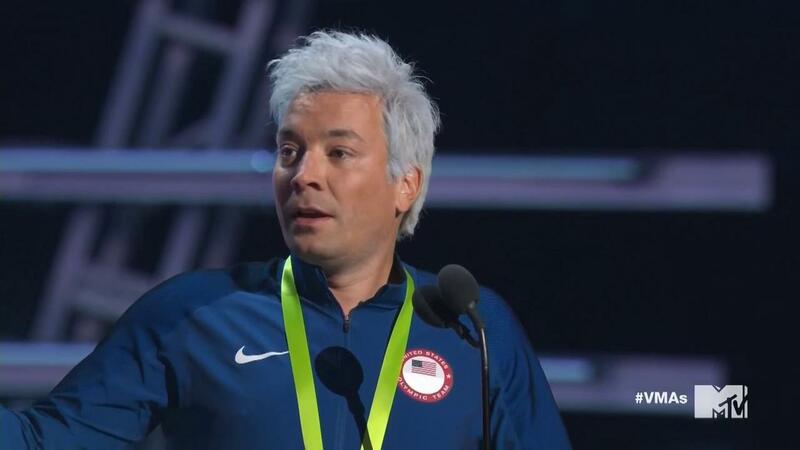 Presenting the night's biggest award, video of the year, 'Tonight Show' host Jimmy Fallon stormed the stage in full U.S. Olympic Team regalia. But it wasn't just his outfit that made Fallon stuck out. The brunette host sported a new do as he came to the mic: the same platinum locks that adorned swimmer Ryan Lochte's head this summer at the Rio Olympics. "Is it too late for me to say sorry?" Fallon sang to the audience in Madison Square Garden, referencing the video of the year-nominated hit, "Sorry," by Justin Bieber. Following the crowd's laughter, Fallon added, "I wrote that song. I wrote it, I produced it, I directed the vidya." Michael Phelps, the most awarded Olympian in history and Lochte's teammate, was in attendance and snapped photos, laughing, as Fallon lampooned his teammate. Phelps was a presenter at the show and received a standing ovation earlier in the night. Lochte, who has won 12 Olympic medals in his career, made waves outside the pool this summer in Rio when he was caught fabricating an incident with Rio Police who he claimed robbed him and fellow athletes at gunpoint. Fallon had fun with the swimmer's habit for embellishment, telling the audience, "I'm the one who gave Adele the phone," referring to the British songwriter's hit "Hello" which was also nominated for video of the year, and mentioning that all the video of the year nominees were "so great, I couldn't choose if there was a gun to my head." Ultimately, the Moonman went to Beyonce, who surpassed Madonna as the most awarded artist in VMA history.